If you’ve used a Windows computer over the years, you’re probably familiar with the Blue Screen of Death, a dreaded error message that indicates a particularly serious problem with your PC. 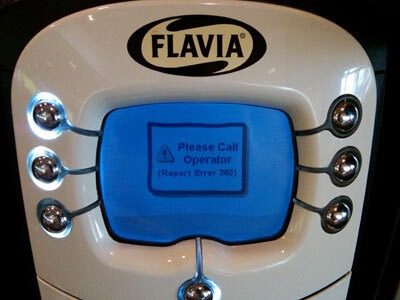 The process of making a cup of coffee shouldn’t result in a non-user-friendly error code. And this comes from a guy who works in IT, by the way. When Joan asked me if I’d be interested in joining her at a medical conference called SOAP in San Antonio — a town I had never visited before — I quickly concluded that I couldn’t pass up the opportunity. Wednesday. We took a pleasant, late-afternoon Continental flight with a stop in Houston en route to San Antonio, then checked into a spacious suite at the gorgeous Hotel Contessa, located along the scenic San Antonio River Walk that runs through the center of town. Thursday. After an early lunch at the nearby Twin Sisters Bakery + Cafe, we took a brief self-directed tour of the Alamo — the most visited landmark in Texas, but one that seemed rather underwhelming to both of us. Joan registered at the SOAP conference at the Grand Hyatt, then we took a lesiurely afternoon stroll along the river back to the hotel. At the Contessa, we ordered drinks at the ground-floor bar while watching several guests dance to the music of a live salsa band, then returned to the Grand Hyatt to put up Joan’s research poster. As night fell, we enjoyed a delicious Mexican dinner at Casa Rio, the oldest establishment along the waterfront, and even requested a song from a mariachi quintet during our meal. Our first full day in town came to an end with a late-night dip in the hotel’s rooftop pool and hot tub. Friday. After completing a few early-morning calls for my ongoing job search, Joan and I ate a late breakfast at Las Ramblas, the hotel restaurant. Our afternoon was highlighted by Joan’s successful poster session at Grand Hyatt, followed by outdoor celebratory drinks at a martini bar called Swig. Based on several local recommendations, we decided to splurge for an upscale dinner at Bohanan’s, where we enjoyed some of the best filets of our lives! Before we went to sleep, we were pleased to hear about some excitement back home, too — the Flyers completed a stunning four-game comeback with a thrilling Game 7 win over the Bruins to advance in the NHL playoffs. Saturday. Our final full day in San Antonio was a busy one. We ate another wonderful Mexican meal at a crowded Mi Tierra (including another serenade by a mariachi duo! ), browsed the numerous shops in El Mercado, and poked our heads inside the historic San Fernando Cathedral. The long line for a mid-afternoon River Walk cruise was well worth the wait, and we later bought a lovely painting of the colorful umbrellas along the River Walk at a charming gallery in La Villita. Joan and I caught our second wind with a return visit to the hotel’s rooftop pool, then hopped a cab to the Tower of the Americas for a breathtaking view of the city. We opted for a nighttime River Walk cruise, then shared some tapas at an outdoor table back at the Contessa. Sunday. We reluctantly checked out of our wonderful hotel, then flew through Houston back to Philadelphia. It was a terrific trip for both of us, and I can’t wait for our next adventure together.